Fully head to toe Primark outfit. It's been a while since I've posted a Primark #OOTD some of you may recognize these pieces. If you haven't checked out my November haul do find it linked here. I've been after a monochrome cape for some time now, so this was very exciting for me when I found a gorgeous one in Primark. It feels so damn soft, 100% worth the £16 I paid. I got a M/L size, just because I LOVE overrsized-ness. Another Pri-gem I found were these boots, they're Limited Edition. 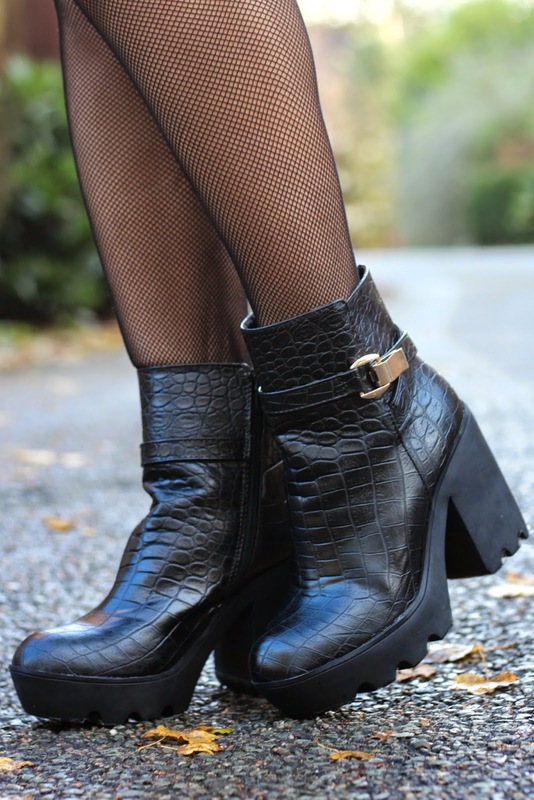 Croc style, with a cute gold clasp on the side. They are so damn comfy too. (with gorrrrgeous fur lined soles) Do get in there quick, there weren't many sizes left! That cape is so gorgeous, you have awesome style! Such a good way to wear fishnets. Plus, I have major hair envy! I love this look! And your photos are really beautiful! In love with all your outfits, you have a perfect style! Love this outfit :) can't believe it's all from primark! You look beautiful! I like the outfit! I can't believe the top's primarni, looks so expensive! Those boots are definitely a Pri-gem! Lovely outfit. I'm a new follower and cannot wait to read more mosts from you! I have to have your boots! They are so adorable and edgy!!!!! Wow, you and your outfit look so pretty! It is crazy to me for how little you can buy clothes at Primark, however I strongly question the brand... I've heard some pretty bad stories about the working environment for the workers in their factories.